Scott Wilk meets me at his second office, a Starbucks on the Danforth in Toronto where he often meets with clients to talk about the watch he will create for them. Recovering from a family vacation, he sips his coffee and works on a breakfast sandwich – his actual breakfast today – while we talk. Scott is busy. 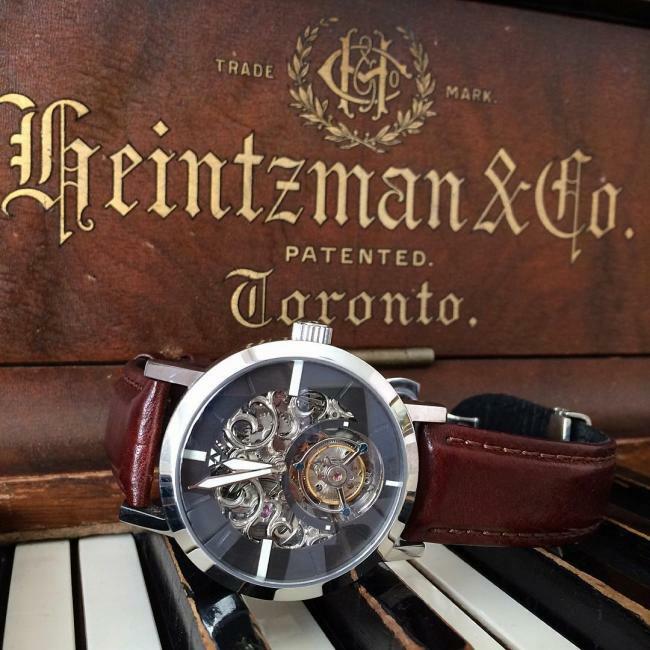 A one-man show until recently, Scott’s watch-making business has grown over the last 5 years to the point, now, where he’s had to hire someone to help keep up with the demand for his creations. Turn-around times for his watches, still in the 4-month range, were lengthening and Scott found this unacceptable. With a core design vocabulary that emphasizes skeletonized architecture, his watches are so highly customizable each piece is virtually bespoke. Delicate conversations aren’t the only kind of discussion Scott has with his customers. As well as partnering with clients in their customization choices, care and education are an important part of his business: “Education is very important to me. I do a lot of that with my customers. People don’t always know that watches need to be treated carefully. Watch mechanisms are delicate machines and no matter how well they’re built, a sharp shock will break or bend a sub-millimetre piece. It’s physics.” Scott’s web site offers a host of tips for the proper care of not just the watches he sells but mechanical watches in general. 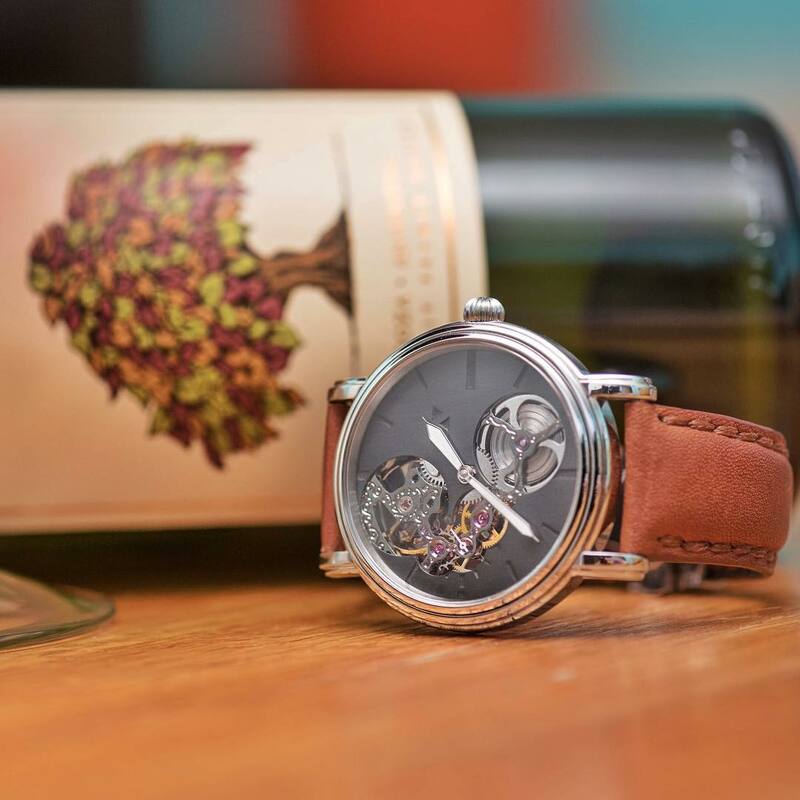 He backs up his craftsmanship with a 2-year warrantee and does repairs, though that part of his business has shrunk relative to the actual making of watches. Lydian Skeleton Tourbillon with black and white Swiss Super-Luminova and one-minute carousel tourbillon in a 44mm stainless steel case. Scott’s watch. This became apparent when he slipped off the watch he was wearing and handed it to me. One of his beautiful – and most popular – Lydian designs, the watch had many of the hallmarks that differentiate higher-end watches from those in the mid to lower tiers: careful attention to details like fit and finish, polishing, and the intricate play of colour and light (even in the dimness of the coffee shop) on the unique dial. Scott’s creations have a premium feel precisely because of the skills he brings to watch making from fine art and jewellery design and manufacture. His watches also foreground their nature as complex miniature machines in their skeletonized presentation of the movement. “I try to strike a balance between simplicity and complexity…overall design balanced against the complexity of the exposed movement,” he explained. The watch I held in my hands was a perfect example of this balanced aesthetic. Surfaces were skillfully and artfully excised or pared-away to frame depth, complexity, and motion. And all of this was enclosed in a case whose attention to finishing details made the watch unique. This sense of uniqueness is important to Scott both as an artist and as a businessman: “The industry is set up to produce a high run of one thing and I’m trying to come at it from the other direction. 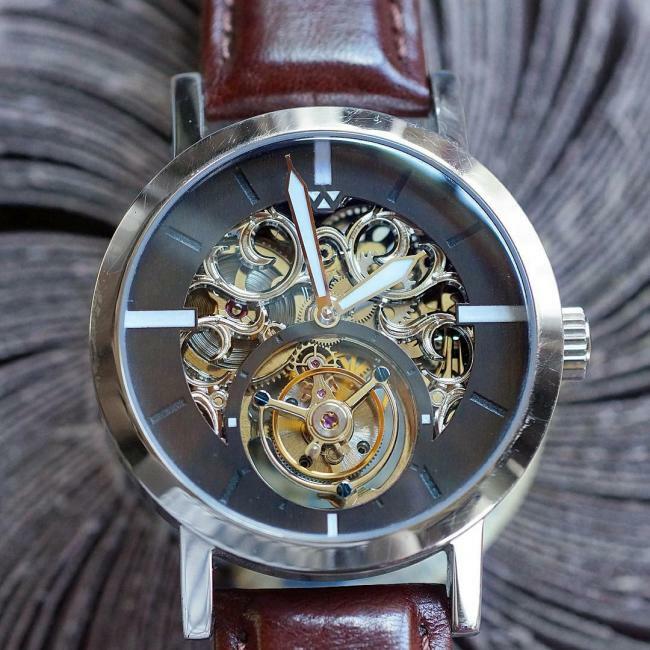 I want to make one-off pieces to differentiate myself from other watches out there.” His emphasis on distinctiveness also comes from his education in fine art. Modern mainstream luxury watch design is, with some exceptions, an echo chamber of homage, repetition, and variation on proven themes. In other words, it’s mostly conservative because it’s also a business that needs to stay solvent. Leaning in for emphasis, Scott summed it up: “There’s a lot of crossover in the industry. Historic designs are common. Homages proliferate in the watch industry and that’s problematic for me because, in the art world, that simply wouldn’t be tolerated.” His artistic ethos is, however, tempered by his pragmatism as a business owner. He sources his movements from Chinese and Swiss manufacturers and gets his cases from another supplier. He is grateful to technology because, he says, “without it I wouldn’t be in business. Ten years ago, I couldn’t be doing what I’m doing. My watches are inexpensive because I can innovate with my supply chain and sales channels. It’s just materials I have to pay for. When I started out I asked myself ‘How am I going to do this?’ I don’t want to deal with stores. I want to have that direct relationship with my customers.” And he does. His business has grown in the last 5 years to the point where he had to make some changes, like moving his bench from the living room to the basement of his home and hiring help. The growth came from promoting his watches through regional art shows (which he still does) and through social media channels like Instagram (wilkwatchworks) where customers worldwide have discovered him. Scott finished up his coffee and breakfast and concluded our discussion. He had work to do.